I mean, without using an X-Ray. Recently a person was able to do just that, though I expect it wasn’t pleasant. A 36 year old man went into an ICU with acute heart failure. 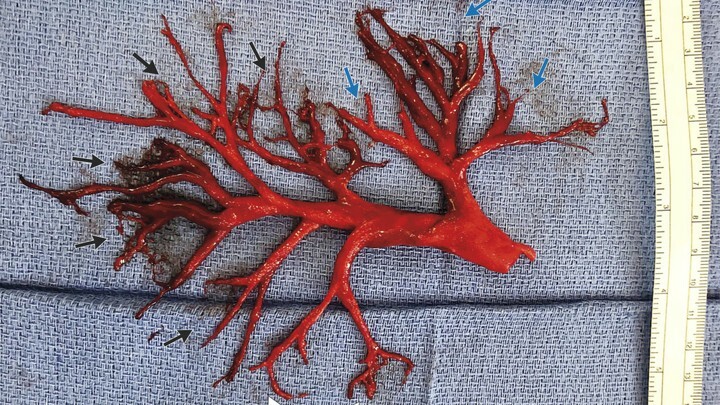 Later that week, he coughed up a blood clot consisting of much of the right bronchial tree. In later examination, doctors saw a small amount of blood in his lung, so this clot was blood that had bled into the bronchial tubes, and clotted there. A previous student of mine showed me this video, which actually ties in with something I had just found out about a few weeks previously. By combining a cheap, paper microscope that cost about $0.50 to make, and a child’s spinning toy, it is possible to diagnose malaria, which kills millions each year. The microscope is called the Foldscope. It’s printed on a heavy piece of die-cut paper, and then gets cut out and folded into a surprisingly powerful microscope, able to see blood cells. You can preorder these yourself (I have!). The other piece, the spinning toy, replaces expensive centrifuges to separate the blood into components. Coupled together (along with a doctor) you can do the lab work for diagnosing malaria for under $1. There are a number of things that are naturally antibacterial. Silver, for one. For a long time, people have been using silver in things to help stop diseases. There’s also dragonfly wings. Now, scientists are making surfaces similar to the dragonfly wings to destroy bacteria. These are called nano-textured surfaces (NTS) and might lead to new materials that help prevent diseases. Stem cells are the special cells that can turn into any kind of cell in the body. Embryos have them, and use them during development. This has lead to controversy as collecting stem cells needed destroying an embryo. Now we can take cells from an adult, and turn them into pluripotent stem cells by reprogramming them. This can be done by turning on genes that are active in stem cells, and turning off genes that are active in whatever type of cell they are. Scientists also introduce proteins that are important during embryonic development. Hopefully this will allow stem cell research in the United States to catch up with the rest of the world. Researchers announced this week that they have regrown part of the spinal column of rats. They implanted neural stem cells in the corticospinal tract of rats, and managed to get them to grow as spinal cord cells. The rats gained an increase in motor function (they could move better after the new cells grew). Previous research had tried to do something similar, but this was the first time they got regeneration of spinal cells. This work shows promise for creating new therapies for humans. Two years ago, in September 2013, cavers went deep into the Rising Star cave in South Africa. They found fossils of a previously undiscovered ancestor of humans. The new species, Homo naledi, fits into a fossil gap between the Australopithecine, and Homo erectus. The followup expedition found more bone fossils than at any other pre-human site in Africa. They found bones from at least 15 individuals. Many of the features fell between what you would expect for Australopithecus and Homo: teeth, pelvis, hands, etc. The skulls looked like Homo, but the brain case was a little of half the size of H. erectus’s. It is difficult to determine how old the fossils are. They weren’t found embedded in rock, which would allow radiometric dating, and are too old for carbon dating. If H. naledi is very old, it could predate Lucy; if young, it would be contemporary with H. erectus. But most likely is that it would fit in just as the Australopithecines and Homo branched, around 2,000,000 years ago. You can read more at National Geographic, The Atlantic, and the Washington Post.